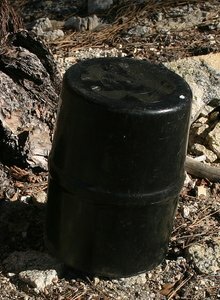 This wild places program is part one of an exploration of the situation in the Sierra Nevada wilderness areas that lead to the development of the bear-resistant food canister. Why were they invented, who invented them, and how did that happen? Harold Werner, a wildlife biologist from Sequoia & Kings Canyon National Park. Tori Seher, a wildlife biologist from Yosemite National Park. Richard Garcia, the president of Garcia Machine, manufacturer of the Backpacker's Cache. Calder Reid, wilderness manager for the Inyo National Forest. Harold Werner, Calder Reid, and Tori Seher are members of the Sierra Interagency Black Bear Group (SIBBG), the standards-setting body for bear management in the major Sierra Nevada wilderness areas. Next week, we'll give you updates about how the industry grew from these beginnings, and the effect all of this has had on parks, forests, bears, and wilderness visitors. This edition was originally presented on August 24, 2006.